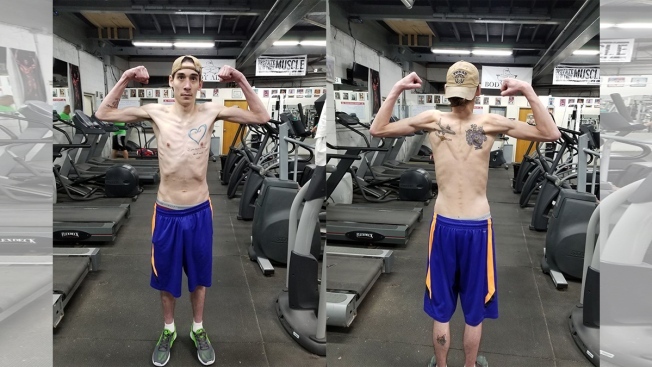 While most people don't go to the gym to gain weight, upstate New York man with cystic fibrosis is on a journey to become a body builder that has inspired thousands of social media users. Jared Wells, of Utica, has been battling the genetic disease his whole life, with the last five years being especially rough, according to Vinny Donelly, his best friend. After being released from the hospital a couple of months ago, his doctors finally gave him clearance to work out. "All right, you want to go to the gym at six in the morning?" was Donnelly's response when Jared asked if he'd help. Wells began working with Donnelly at Body Alive, a fitness center owned and operated by Vinny's father, Bob Donnelly. Five days into their training, Bob Donnelly took notice and posted Wells' story on the gym's Facebook page, as a motivational post. Since then, Wells' story has gone viral on social media, with the initial post being shared more than 500 times. "We expected it to get the maybe 200 likes that the page usually gets, then all of a sudden it was getting thousands" said Wells. "It's kind of exciting, and it's all been really positive." When asked about his reaction to the story's response, Wells said, "I'm just glad that I've been able to inspire people through this. It serves as motivation for me." Wells' has been able to gain six pounds in just twelve days, his long-term goal being to become a professional bodybuilder, but for now the current focus is Wells' health. "Eventually we're going to come up with a more structured workout plan. For now the goal is to gain some muscle and build a good base." said Wells. Vinny Donnelly has created a GoFundMe account for Wells, to help with medical bills as well as supplements to help keep him healthy.